The Gold Coast Child Protection Steering Committee are coming together to host three Family Fun Expo events and one Professional Development event to cover the Gold Coast Region to raise awareness and promote the message “Protecting Children is Everyone’s Business”. 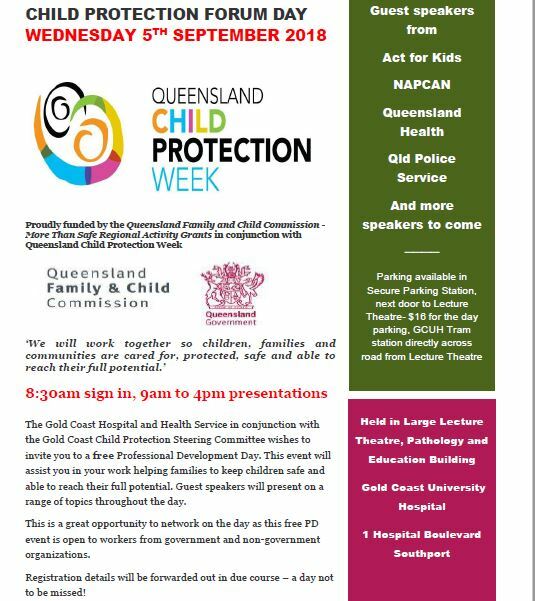 Event 4: Wednesday, 05/09/18 at Gold Coast University Hospital, Lecture Theatre 9:00am to 5:00pm – The Child Protection Forum Day will be held in collaboration with Queensland Health and will be open to all professionals interested in learning more about child protection and appropriate referral pathways. The first focus of the workshop will provide basic Child Protection Training 101, including identifying harm/risk of harm and mandatory obligations for reporting suspicions of harm. The second focus will provide referral pathway options for vulnerable children and families, including Family and Child Connect and Intensive Family Support. This event will invite a variety of keynote speakers to present topics relevant to Child Protection.